so. Haircut experiences are not pleasant for me. I go to a place close to where I live and since I go at random times, the person cutting my hair is different every time. For many this may not be a problem, but I don’t see it that way. With every new person comes a different style of cutting, trimming, learning and adapting to arrive at my desired outcome. If I don’t communicate my expectations well, sometimes disaster can occur and I can walk out looking like cut grass after using a dull mower. Not good. Why has this been a problem for me? Because at one time in the past a couple years ago, I went through one of those horrible haircut experiences and looked ridiculous frankly. You know what I’m talking about; we’ve all had one of those. You literally have to go to another salon to get the disaster fixed from the first salon. Naturally, upon going and getting your haircut the next time, those wonderful emotions surge up from the past and are experienced as if it were happening all over again. The fear of them getting it right, the anger that it could be done wrong again, the sadness that my hair might look like a patchy area of grass, not to mention the knock to my pride and experiencing humiliation. Wow, this haircut just became very emotionally traumatic…and it happens every single time every time I get my haircut. 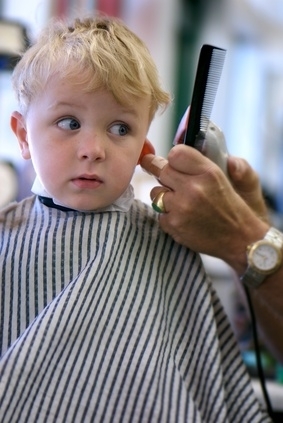 We need to remember that although consciously our traumatic haircut happened years ago and we may not remember it all that well, for the subconscious everything is happening in the present. What we experienced back in the past (our traumatic memory) is literally being relived subconsciously without us even knowing it. Often times in practice this comes out as people saying, “I don’t know why I feel this way all the time.” Something happened in the past and you are reliving the past subconsciously in the present moment. This happens to everyone and most of the time even when we think we have “gotten over it”, we really haven’t. Those old painful memories are constantly replaying like a skipping or broken record. So what was different about the haircut today? As I help others to be aware, conscious and mindful of their emotions (in order to release and let them go and consequently heal), I also need to be mindful of my own emotions and that is what I did while getting a haircut today. I was about 4 minutes into the haircut and I suddenly became mindful that my breathing was very shallow. Also, my shoulders were very tense as were my legs because I was clenching them together. What was I experiencing? Fear. It was the same fear that I had experienced years ago. So what did I do? Let it go. Because we own something, we can make the choice to release and let it go. We all have this power. The haircut served as a mirror of what I was holding onto inside. All of life does this for us when we experience a negative emotion. People, situation and events serve to pull out the things we need to face in ourselves. If anger or rage comes out because someone cuts you off in traffic, I can assure you it is not “the fault” of the other person. That person is a gift actually because they serve to help you see something that is already within you. You are angry and rageful. Why? Because something happened in your past to solidify these things. Be thankful for the situation, own it and make the choice to release it and let it go. So how did I do this? I first began to take deep diaphragmatic breaths (using my stomach mainly). Using your breath in this way is the first step to letting something go. I was restricting my breath because I was holding onto the fear. Next, I literally and lovingly just said to myself, “Let go of the fear.” It really is that simple. If this is not concrete enough, those who are familiar with EFT (Emotional Freedom Techniques), if you are somewhere you can’t tap (like in the haircut chair), simply visualize yourself tapping. The effect is the same. Replace the fear with peace and love. A very famous verse says, “There is no fear in love, perfect love casts out all fear.” The opposite of fear is love. The energy of love and peace is very healing. I was not experiencing love in that chair; I was caught up in my fear. I made a choice in that instant to replace the fear with love, joy and peace. What immediately happened? I continued to breathe deeply. My shoulders and legs let go of the tenseness and relaxed. I even carried my fear to its logical conclusion, or the worse possible scenario, which also helped me to let it go. My thought was, “So what if she butchers my hair and I have to shave it all off?” Everything still would be ok, much worse things in life could happen. The power of the fear dissipated. It’s not a big deal, although if you are a woman, losing all your hair could be slight more of a big deal. The thought was carried to its logical end helped me to let it go. The woman who was cutting my hair was a professional and of course if there was a problem she could fix it. Again, not a big deal. My fear was replaced with peace that it would turn out perfectly. I no longer projected my fear onto her, which alone could have caused her to mess it up since we are all energetically linked and affect one another. What was the result? My hair actually turned out just the way I wanted it to and instead of experiencing fear the entire time, I began to experience the qualities of Divinity, of God right there in that chair. God is love, joy and peace; those are his attributes and qualities. Who doesn’t want to experience that? I literally connected with God in that chair. We have far more power than we think, especially when it comes to our past and the emotions we subconsciously hold onto. We can choose to really let go of our past (including the negative haircuts) and experience love, joy and peace. So I encourage you to be more mindful of what you feel, own your feelings (even ask where they came from in the first place), release them and replace them with love, joy and peace. What do you need to start letting go of?